Toutes les fois que dans une équation finale on trouve deux quantités inconnues, on a un lieu, l'extrémité de l'une d’elles décrivant une ligne droite ou courbe. La ligne droite est simple et unique dans son genre; les espèces des courbes sont en nombre indéfini, cercle, parabole, hyperbole, ellipse, etc. Whenever two unknown magnitudes appear in a final equation, we have a locus, the extremity of one of the unknown magnitudes describing a straight line or a curve. The straight line is simple and unique; the classes of curves are indefinitely many,—circle, parabola, hyperbola, ellipse, etc. A mathematician thinks that two points are enough to define a straight line, while a physicist wants more data. A tree nowhere offers a straight line or a regular curve, but who doubts that root, trunk, boughs, and leaves embody geometry? Every body continues in its state of rest or uniform motion in a straight line, except in so far as it doesn’t. … The suggestion that the body really wanted to go straight but some mysterious agent made it go crooked is picturesque but unscientific. Paraphasing Newton’s First Law of Motion. In a Gifford Lecture delivered at the University of Edinburgh (1927), 'Gravitation: The Law', The Nature of the Physical World (1928), 124. The distance from the centre. There’s now no need for rule of thumb. In poem, 'The Kiss Precise', Nature (20 Jun 1936), 137, 1021, as quoted, cited, explained and illustrated in Martin Gardner, The Colossal Book of Mathematics: Classic Puzzles, Paradoxes, and Problems (2001), 139-141. If this is a straight line [showing his audience a straight line drawn by a ruler], then it necessarily ensues that the sum of the angles of the triangle is equal to two right angles, and conversely, if the sum is not equal to two right angles, then neither is the triangle rectilinear. 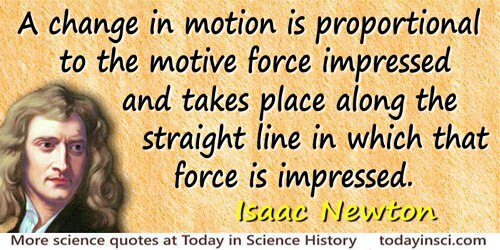 Law 2: A change in motion is proportional to the motive force impressed and takes place along the straight line in which that force is impressed. The Principia: Mathematical Principles of Natural Philosophy (1687), 3rd edition (1726), trans. I. Bernard Cohen and Anne Whitman (1999), Axioms, or Laws of Motion, Law 2, 416. Lawyers have to make a living and can only do so by inducing people to believe that a straight line is crooked. This accounts for their penchant for politics, where they can usually find everything crooked enough to delight their hearts. As quoted in Harry Black, Canada and the Nobel Prize: Biographies, Portraits and Fascinating Facts (2002), 19. Mathematics … certainly would never have come into existence if mankind had known from the beginning that in all nature there is no perfectly straight line, no true circle, no standard of measurement. From 'Of the First and Last Things', All Too Human: A Book For Free Spirits (1878, 1908), Part 1, section 11, 31. Our account does not rob mathematicians of their science, by disproving the actual existence of the infinite in the direction of increase, in the sense of the untraceable. In point of fact they do not need the infinite and do not use it. They postulate any that the finite straight line may be produced as far as they wish. In W.D. Niven (ed.) 'Illustrations of the Dynamical Theory of Gases,' The Scientific Papers of James Clerk Maxwell, Vol 1, 377. Quoted in John David Anderson, Jr., Hypersonic and High Temperature Gas Dynamics (2000), 468. The Thirteen Books of Euclid's Elements Translated from the Text of Heiberg, introduction and commentary by Sir T. L. Heath (1926), Vol. 1, 155. The path isn’t a straight line; it’s a spiral. You continually come back to things you thought you understood and see deeper truths. The phenomena in these exhausted tubes reveal to physical science a new world—a world where matter may exist in a fourth state, where the corpuscular theory of light may be true, and where light does not always move in straight lines, but where we can never enter, and with which we must be content to observe and experiment from the outside. 'On the Illumination of Lines of Molecular Pressure and the Trajectory of Molecules', Philosophical Transactions 1879, 170, 164. We see only the simple motion of descent, since that other circular one common to the Earth, the tower, and ourselves remains imperceptible. There remains perceptible to us only that of the stone, which is not shared by us; and, because of this, sense shows it as by a straight line, always parallel to the tower, which is built upright and perpendicular upon the terrestrial surface. Dialogue on the Great World Systems (1632). Revised and Annotated by Giorgio De Santillana (1953), 177. What distinguishes the straight line and circle more than anything else, and properly separates them for the purpose of elementary geometry? Their self-similarity. Every inch of a straight line coincides with every other inch, and of a circle with every other of the same circle. Where, then, did Euclid fail? In not introducing the third curve, which has the same property—the screw. The right line, the circle, the screw—the representations of translation, rotation, and the two combined—ought to have been the instruments of geometry. With a screw we should never have heard of the impossibility of trisecting an angle, squaring the circle, etc. From Letter (15 Feb 1852) to W.R. Hamilton, collected in Robert Perceval Graves, Life of W.R. Hamilton (1889), Vol. 3, 343. When I was eight, I played Little League. I was on first; I stole third; I went straight across. Earlier that week, I learned that the shortest distance between two points was a direct line. I took advantage of that knowledge. You don't think progress goes in a straight line, do you? Do you recognize that it is an ascending, accelerating, maybe even exponential curve? It takes hell's own time to get started, but when it goes it goes like a bomb.